A few years ago, the Hawaii Food Manufacturers Association elected a new president and desired to give their members more exposure and create more excitement, involvement and reward for all of the HFMA members. 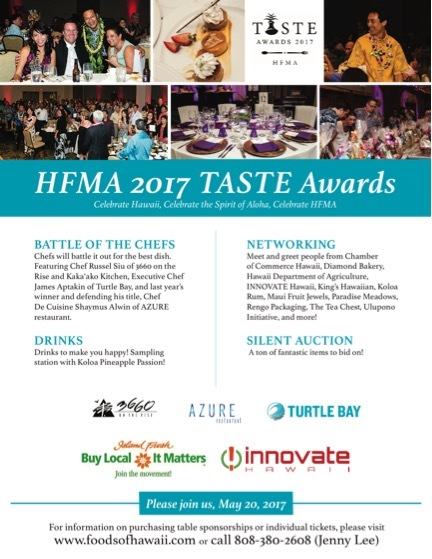 The idea was to create an event called TASTE, which celebrates the mission of the Hawaii Food Manufacturers Association; promoting interests of Hawaii’s food and beverage retailers and suppliers. TASTE would also recognize business leaders for their achievements during the course of the year, as well as honor significant pioneers in the local food industry. We were initially brought in as the PR arm for the event, but this changed quickly as we became more involved with the project as a trusted confidant and consultant. The event had a variety of facets that included a chef competition, silent auction and a robust program. Our team was instrumental in securing emcees, generating public service announcements to promote the event, securing media partners and increasing attendance. The event has garnered a great deal of publicity over the years and increased the visibility of local chefs, while funding has supported the Kapiolani Community College Culinary Institute. 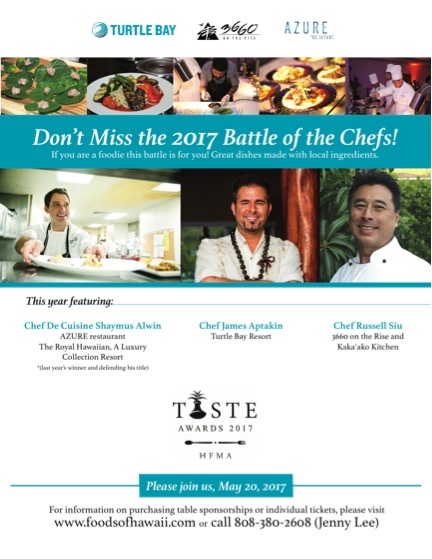 One of the chefs, James Aptakin, currently the Executive Chef at Turtle Bay Resort, won the first year of the competition. Chef James went on to achieve first runner up in the World Food Championships, receiving accolades as a highly regarded international chef. TASTE was certainly a springboard for him. We are proud of the visibility we have achieved for HFMA and the local food industry, as well as the funding for the KCC culinary program.